I loved this quote when I read it on the Robert Genn Twice-Weekly Letter. Sara is an artist in addition to being Robert's daughter. She is carrying on the newsletter as they deal with Robert's terminal illness. These days the newsletter is bittersweet. So, I gave myself a couple of those gifts last week. 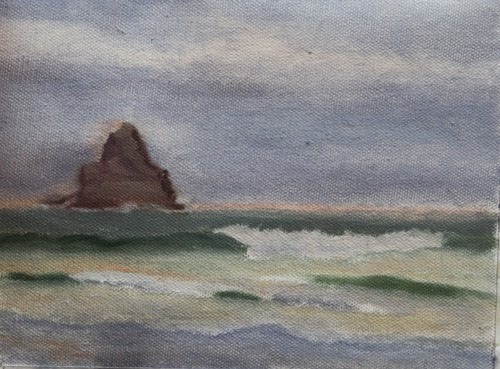 I went out painting at Arch Cape as the winter storm that is now upon us hadn't arrived yet and the waves were so tiny. I am pushing myself, trying hard to achieve several aspects I desire in my seascapes. 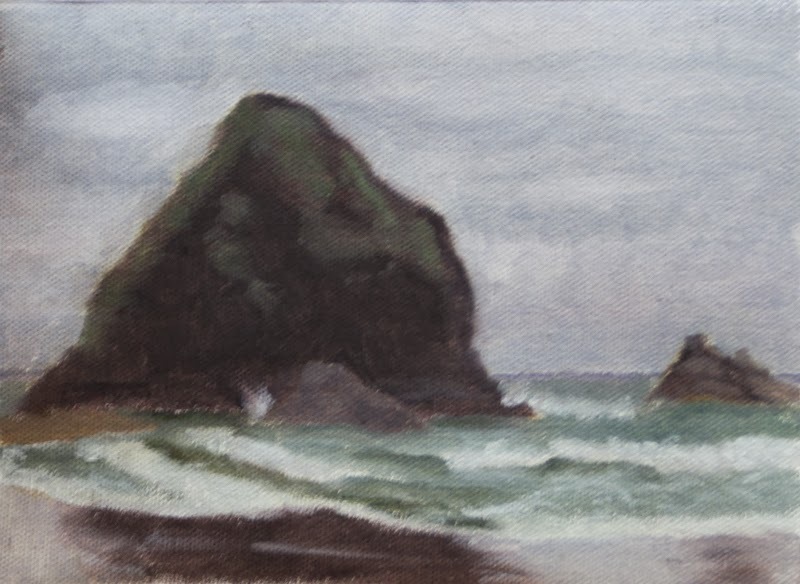 I have mainly focused on the waves the past 68 wave studies but I do eventually plan to add the surrounding rocks and cliffs. On the days when the waves a too tiny, I am starting to turn to the rocks. Arch Cape has plenty of beautiful rocks the size of large hills. I painted two wave studies. The first one, Wave Study #69 was one hour long. The second, Wave Study #70 was 45 minutes long. I had a time constraint and absolutely had to cut it off at 4:00 pm. The light was fading pretty fast anyway. I considered working on them further in the studio before calling them good but I am finding that I prefer the studies to be in the raw state. They are not meant to be finished but are meant for practice and for references for finished work. I am finding that these give me plenty of information. That said, I might clarify a few things on Wave Study #70 before my memory fades. 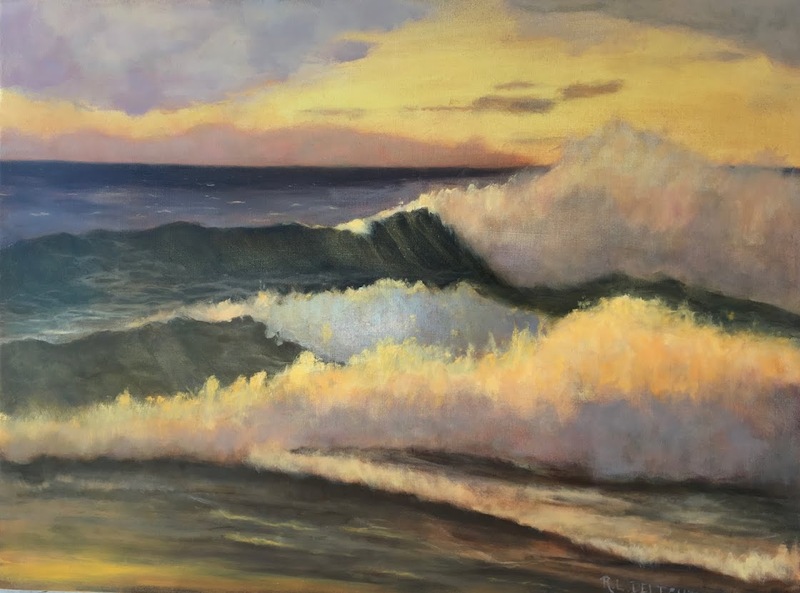 I believe I will try my hand at creating a finished painting from Wave Study #69 this week. We have a nice little storm going on at the moment and cold arctic air is due to arrive tomorrow later in the day. I might see if I can squeeze another study in tomorrow as I have an errand up the coast. I think I will take along my painting gear and see if I can get a plein air session in before the weather gets too extreme. Last week the studio paintings I made were not to my satisfaction so I did not post them for sale. I will be able to use the last one for the next post as I unintentionally used a study I already had created a studio painting from. It is interesting to see the difference between them all and will make a fun post. I have 30 more plein air wave studies to go before I hit 100. I already know that I will continue to create seascape studies after 100. I will not be posting all of them after I pass 100 though, maybe not even any of them. I plan to have plenty of finished paintings to post about instead. With this in mind, I am now going to slow down my posts on my remaining 30 wave studies. I will still post the occasional wave study and I will definitely post the road marker ones such as every fifth study and the 100th of course. I am finding I want to push myself even more, which in turn means more flops to cry over. I want to be able to do that without squirming every time I feel I have to post one of those flops. I hope to have plenty to post about as I want to bring more paintings to completion to raise funds for the workshop I will be taking in the spring. It is going to be a busy winter!